The long summer weekend was invented in Washington’s San Juan Islands, or should have been. Summer stretches languorously here, with 16 hours of daylight—enough time to savor the islands’ patented pleasures: orcas and eagles, kayaking and hiking, and a food scene that shows the influence of a burgeoning slow-food movement. Orcas Island local Bob Friel guides us on an island hopper’s midsummer dream. Orcas is the island of superlatives. It’s the biggest of all the San Juans’ 750 islands, with the highest mountain, the deepest fjords, and the most jaw-dropping views. All this inspiration draws a notably creative crowd, and many artists call Orcas home for at least part of the year, from potters, painters, and sculptors to Gary Larson of The Far Side fame. Go with it. Drive off the early ferry from Anacortes (an hour crossing) and onto Orcas Road to begin your art- and nature-packed tour. First stop, Crow Valley Pottery & Gallery, showing 100 artists, most inspired by native Northwest culture and wildlife. Outside Eastsound, keep an eye out for the dazzling kinetic metal sculptures spinning and flashing in the fir trees at Howe Art Sculpture Park & Gallery. Eastsound is Orcas’s main village. Depending on your mood, it can entertain you for 20 minutes or fill a day with eating and gallery hopping. At Roses Bakery Cafe, crowd your picnic basket with bread, cheese, and Northwest wine. Then head east out of town along Crescent Beach and south around the bay. Here, 5,200-acre Moran State Park offers great picnic spots, from placid Cascade Lake to the top of 2,409-foot Mt. Constitution for the San Juans’ best view. Try to squeeze in the Lambiel Museum, an impressive private collection of San Juan Islands art that can be toured with the collector himself, Leo Lambiel. Complete your Orcas day with Alaska scallops or Northwest bouillabaisse at the bayside Inn at Ship Bay (it’s a fine overnight option too). The halibut tacos served at the restaurant of the waterfront Kingfish Inn (another good overnight choice) are a local favorite. Be sure to ask that they be served on a regular plate; the taco baskets make the tortillas soggy. Water morning. Head to Orcas’s far west coast and the hamlet of Deer Harbor. 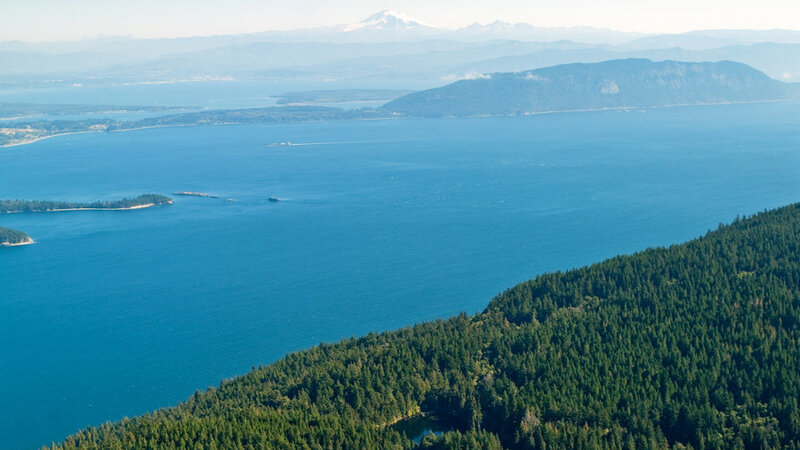 At Bellport Deer Harbor Marina, meet your guide from Shearwater Kayak Tours for a three-hour exploration of clear waters and kelp forests surrounding the Wasp Islands, which dot the sea between Orcas and Shaw Islands. Then it’s back to the ferry landing to catch the 40-minute boat ride to San Juan Island. San Juan is the most populated island of the chain—so relatively cosmopolitan that its largest town, Friday Harbor, is dubbed “Sin City” by residents of other islands because of its wider selection of bars. Still, urban misbehaving isn’t what you first notice here: It’s the bucolic photo ops, like those at fragrant Pelindaba Lavender Farm. More views and cliffside driving come along West Side Road overlooking the Haro Strait and Vancouver Island. Then continue north, navigating your way to Roche Harbor Resort, and join the posse of wealthy yacht-ies and wannabes grabbing cool ones at the Madrona Bar & Grill. If you can withstand yacht envy, stroll the docks afterward and drool over the costly boats. The best dinner choice, Duck Soup Inn, shines with its grilled kelp-dusted Alaska sea scallops, its applewood smoked local oysters, and an exemplary fresh corn soufflé. For lodging, tony Bird Rock Hotel is in the center of Friday Harbor (innkeepers dispense earplugs in case guests are bothered by small-town bustle). Outside town, very close to Duck Soup, the pastoral 82-acre Lakedale Resort at Three Lakes offers rustic canvas tent cabins, private log cabins, and lodge rooms. Whale day. Power breakfast on omelets and hash browns at locals’ favorite Rocky Bay Cafe, then meet the San Juan Islands’ most famous summer inhabi­tants, the up-to-25-foot-long, 12,000-pound southern resident killer whales. To try for an eye-level orca sighting, Outdoor Odysseys is genuinely one of the greatest beginner’s kayaking experiences you’ll find anywhere: Orcas aren’t absolutely guaranteed but are likely. Or, if you don’t want to have your whale experience out on the water, hit the Whale Museum, by far the San Juans’ best indoor attraction, with whale exhibits, whale skeletons, and a whale phone booth where you hear whale songs, with no long-distance charges. For a weekday lunch, the nearby Market Chef has excellent sandwiches and salads. Now for a San Juan Island secret. The Backdoor Kitchen isn’t exactly flashy: This intimate bamboo-screened oasis is squirreled away behind Friday Harbor Freight yard. No wonder few visitors find themselves here. But you should, and be sure to allow enough time before your reservation to sit at the tiny copper bar and order a cocktail. The dinner menu continent-hops from Thailand to the Middle East, then back to the Northwest, and it’s all stellar. “Slow-pez” San Juaneros call it, for Lopez Island’s bucolic, unpeopled setting and its friendly, finger-wave pace. You’ll probably notice the island’s relaxed rhythm as soon as you dock after the hourlong ferry ride from Friday Harbor. Because it’s flatter than its sister islands, one of the best things to do here is ride bikes. You can rent them at Cascadia Kayak and Bike and head to the tiny smattering of shops that makes up Lopez Village. Stop at Caffe La Boheme for coffee, and then, fortified, pedal north the 3.5 miles to 138-acre Spencer Spit State Park, where a triangle of sandy beach surrounding a saltwater lagoon is loaded with driftwood like Lincoln Logs, which locals like to pile into fantastical sculptures. Back at Fisherman Bay after returning your wheels, have your last island meal at the Galley, where fresh halibut and Lopez oysters are served at hand-painted tables. The food is so good, the setting so beautiful, that when you consider boarding the ferry back to “the real world”—what islanders call the mainland—you may just decide to stay. And if you do, MacKaye Harbor Inn is a gracious farmhouse turned five-room inn right on the water.